Rhythm Pad® is a portable drums application for iPhone, iPod touch and iPad which includes high quality drum kits ranging from Real to Electronic kits. Whats new in Rhythm Pad® 4 and later? Rhythm Pad® 4 and later includes a host of new additions including extreme low-latency response, Audiobus support, AudioCopy support, MIDI over WiFi and more. If you find the notifications from Rhythm Pad® to be more annoying than useful, this is what you need to do: Open up Settings. Select Notifications. 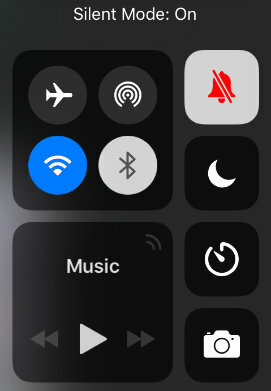 Select Rhythm Pad from the list under the section, In Notification Center and flip the Notification Center toggle to Off. This is rare, but if this occurs, try restarting the app. Please check if your main volume is muted. If you are an iPhone user, please try toggling the side switch. Try raising the volume. (*) If you do not see the bell icon, this feature is assigned to the side switch. In that case, just toggling the side switch should unmute your iPad speakers. The option to set the side switch funtion to Lock Rotation or Mute can be found under Settings. If none of these suggestions work, contact us and we will surely get back to you. How can I share my feedback or suggest features for the upcoming versions of Rhythm Pad®? We greatly appreciate your suggestions and feedback. We strongly listen to our users and work hard to get these features implemented as updates. Contact us to share your feedback and/or suggest new features..